Visualization of the Week: Anachronistic language in "Mad Men"
"Mad Men" returns on Sunday night for its fifth season, and Princeton grad student Ben Schmidt returns with a look at anachronistic language in the series widely acclaimed for its historical accuracy. Last month, we looked at Schmidt's visualization of anachronistic language in PBS' "Downton Abbey," which is set in the 1910s. 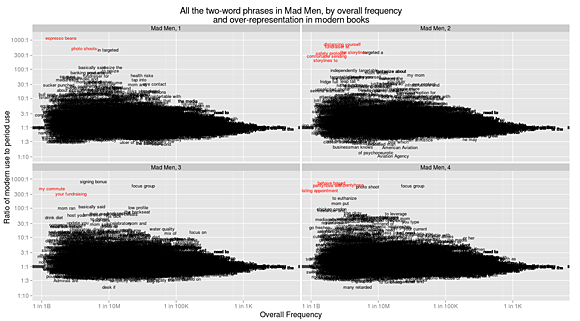 Schmidt takes the same approach to examining the dialogue of "Mad Men," running the scripts through the Google Ngram database to see how the show's language stacks up against texts published in the 1960s. A look at the anachronistic language in "Mad Men." Check out a larger version of this image and read related analysis. How does the show fare? Schmidt has found that there are "noticeably fewer outliers towards the top" in "Mad Men" compared to "Downton Abbey." Moreover, those outliers are actually appropriate. He has an essay in this week's Atlantic looking at some of this language in more detail. Kids Count in Washington, D.C.
Anachronistic language in "Downton Abbey"